Don’t look now, but we’re 9 for 10 on cashing lineups over the last two weeks! And we’re back for more cash in Week 4! As usual, before we get to winning you bragging rights (and DFS cash), remember, the point of this article is not just to give you one lineup for each site, it’s to give you examples of one or two POSSIBLE lineups. Getting exposure to a few different lineups is always a good idea, so don’t forget to mix and match additional lineups from my suggestions below. And that’s never been more true than in the first week of the season when we have very limited data. Trust me, it’s a lot more fun that way AND you’ll improve your chances of cashing! Let’s get to winning you some CASH in Week 4 of the 2018 NFL season! Also, don’t forget to check out this week’s podcast as Mark Liepold from FFDynasty 260 and RotoUnderworld and our very own Ryan Whitfield give their suggestions for DFS stacks! So, without further to do, here are my suggestions for the Best Daily Fantasy Football Plays for Cash Games for Week 4 contests, along with they’re prices on Fan Duel (“FD”), Draft Kings (“DK”) and Yahoo! Daily Fantasy (“Y!”). 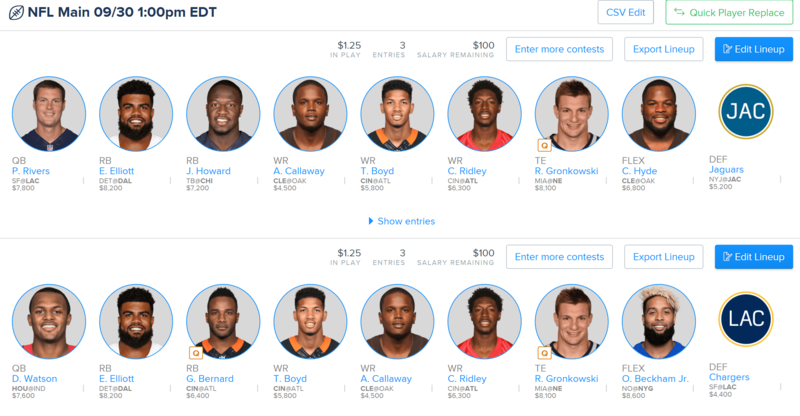 Again, to encourage some diversity in your lineups, I’m giving you two sample lineups for FanDuel this week. Philip Rivers has been solid with an 8:1 touchdown to interception ratio, and now he get’s to face the 49ers 4th worst pass defense who just let Matt Ryan pass for 5 TDs. Yeah, I like me some Rivers in this spot. Indy essentially has no secondary and the Texans are desperate for a win after starting 0-3. Will Fuller is back up to speed, DeAndre Hopkins is still DeAndre Hopkins. 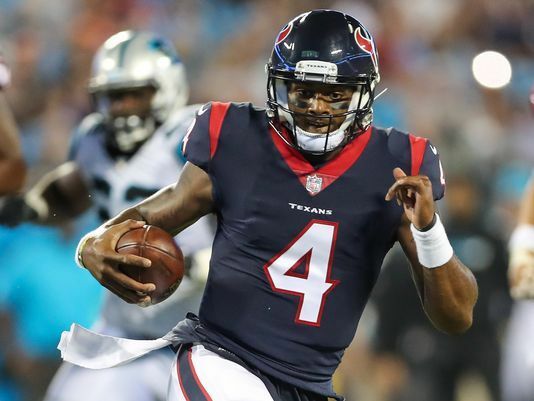 In Week 3, Watson threw for 385 yards and two TDs and rushed for 36 more. His floor and ceiling are high, making him a nice option in cash games. Matt Ryan went big in Week 2 completing 23 of 28 passes for 272 yards, 2 TDs and an INT, also rushing for 2 TDs and went EVEN bigger in Week 3 with 5 TDs. He’s got the Bengals this week, who has a reasonable secondary, but honestly, he’s too hot to sit now that he’s developed a rapport with rookie Calvin Ridley. Plus, this game has the highest over/under (53.5) of any game this Sunday. The Falcons defense has now lost Keanu Neal, Deion Jones, and Ricardo Allen to injury. Andy Dalton, on the other hand, is up to 8 TDs in 3 weeks. Plus, as I mentioned, this game has the highest over/under (53.5) of any game this Sunday. Alvin Kamara hasn’t been notable on the ground, averaging 3.8 yards per carry, but has been killing it in the passing game. He was targeted 20 times in Week 3, catching 15 of them for 124 yards. With all those targets, he’s a great play in all PPR DFS sites. Plus, this game has the second highest over/under (50.5) of any game on Sunday. The Chargers are big favorites and Melvin Gordon has significant usage both on the ground and in the passing game. The volume will be there and so will the opportunity. I think Gordon smashes this week and will certainly be looking to force him into lineups. The Lions currently rank 27th against the run per DVOA and now face Ezekiel Elliott, who is coming off a 127 rushing yards and 3 receptions for 11 more yards in Week 3. Elliott has a nice mix of a safe floor and decent upside in a plus spot, so if you’re paying up at RB, he’s a good choice. Tampa Bay is only 18th against the run per DVOA and Jordan Howard, although not outstanding, has been solid. His additional involvement in the passing game is also a benefit that helps solidify his floor. He’s not good for tournaments, but he’s plenty good for cash games. He’s not available in the main slate for Draft Kings and Fanduel, but if you have access, he’s a solid play. He has no competition in the backfield, is playing at home, and a huge implied team total for the Steelers. I like him better on Yahoo, and like him the lease on Draft Kings, but don’t mind him on any of the sites. No Joe Mixon actually did mean that Giovanni Bernard got all the run in Week 3, rushing 12 times for 61 yards and a TD while catching 5 of his 9 targets for 25 yards. Bernard accounted for all but one of the team’s rushing attempts and was in on 57 of the team’s 65 snaps. After 3 weeks, the Falcons defense is ranked last per DVOA against the run. This game also has this Sunday’s highest over/under (53.5). Oakland is 28th against the run per DVOA and Carlos Hyde is on a roll. In Week 3, he had 23 carries for 98 yards and 2 TDs and a new baby. Hyde has scored a TD in all 3 games this season and has seen carries of 22, 16 and 23. Load up. Rex Burkhead was placed on IR and Sony Michel looks pretty good. But James White has the more established role as the pass catcher, plus I think the Dolphins give the Patriots a run for their money, which plays better for White. The Saints have the worst pass defense in the NFL per DVOA and just got obliterated by the Falcons passing attack. 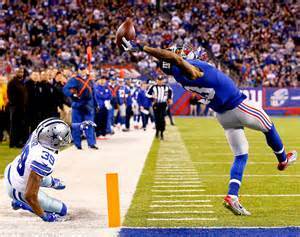 Both OBJ and Shephard look to benefit from this matchup which promises to be high scoring, and is in fact the game with the second highest over/under (50.5) on Sunday. In Week 3, with just half a game with Baker Mayfield, Landry led the team with 14 targets and an 8 receptions for 103 yards, while Callaway, although not doing much with them, had 11 targets and played on 90% of snaps. Sky is the limit with Mayfield under center, and Landry and Callaway will both benefit, particularly against a Raiders defense that’s the second worst against the pass in the NFL per DVOA. And Callaway is dirt cheap. Will Fuller is back and healthy. And that means TD time with Watson under center, as he’s had a whopping 8 TD receptions in 5 games with Watson. Fuller led the team with 11 targets in Week 3 demonstrating the trust that Watson has in him. His upside is immense with Watson and defenses keying on DeAndre Hopkins, and he’s cheaper than Hopkins, so load up! With Alshon Jeffery out, we thought Agholor would see more production with Wentz returning. And although he played 98% of the snaps, he only caught 4 balls for 24 yards. With Jeffery out again, I’m still willing to go back to the well with Agholor. UPDATE – Alshon Jeffery is ACTIVE in Week 4, so I’m off Agholor for this price. Feel free to continue getting exposure in multiple lineups, but not in your primary lineup. Calvin Ridley was blanked in Week 1, had a TD in Week 2, and then went bonkers in Week 3 catching 7 of 8 targets for 146 yards and 3 TDs. Boyd broke out in a big two weeks in a row and is clearly out-snapping John Ross. I like him for all the reasons I like Dalton this week, and he’s still priced well. I’m looking to use him in a lot of lineups. Rob Gronkowski led the Patriots in Week 3 in receptions (4), receiving yards (51) and targets (5) but has generally been criminally under-targeted by Tom Brady over the last two weeks. I’m sure that will change and Gronk is still Brady’s best option in the redzone, particularly in the Pats last week without Edelman. Zach Ertz got 10 targets in Week 1, 13 targets in Week 2, and when Carson Wentz returned in Week 3, he got 10 targets there too, catching 5 for 73 yards. Dallas Goedert was also involved, but Ertz is still going to get his share. Assuming Jack Doyle remains out, Eric Ebron could be in for a bunch of targets, just like the 11 targets he saw in Week 3. He only caught 5 for 33 yards, but with all that opportunity for a discounted price, I’d take him just the upside. Trey Burton is catching TDs in Chicago, but hasn’t had the yardage yet. And when he doesn’t catch a TD, it makes for a rough week. But Tampa Bay’s defense is 25th against TEs, so I like the spot for Burton snag another one, particularly for the price. The Chargers defense has been a disappointment thus far, but with the 49ers losing Jimmy G, there’s little to fear from the San Francisco offense. Fire them up. Jaguars have the top defense in the league are at home against and a Jets offense that doesn’t look as good as we thought they were after Week 1. Really, do you need anymore analysis? 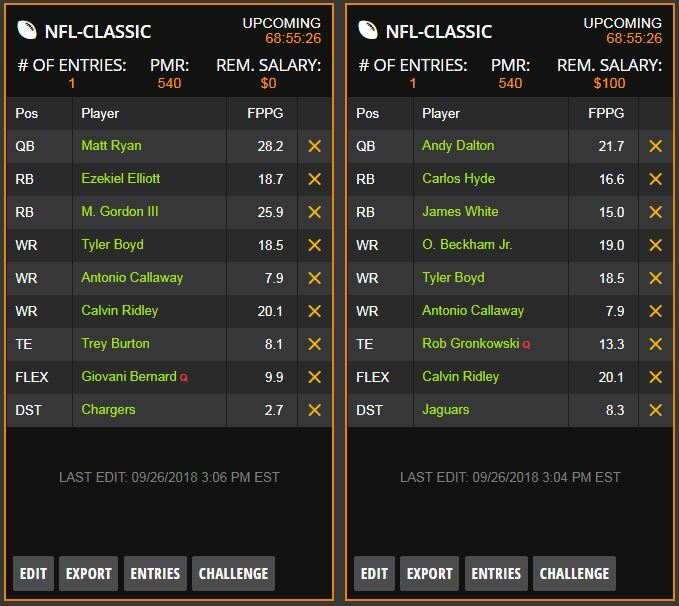 Good luck everyone, and I hope you all win DFS Cash in Week 4!